At the U District Street Fair a customer bought a necklace and bracelet. She came back to my booth later in the day .... she had lost the bracelet while she was at the fair! I felt so bad. So I took her contact info and have made her a replacement. The good part is that this one matched her necklace even better than the first one. Just for Fun - Fur Bead! A friend sent me a link to a woman who is making beads out of ....cat hair!! So just for fun I made her one from fur of my white cat, Snowball. One problem - the bead sheds! Not sure I will be making more of these - but it sure was fun to see the look on her face when I gave it to her! A friend has been lusting after one of my fall glass gardens since last year. This weekend she gets her wish! We are trading art. My favorite way to shop! I have a booth at the University District Street Fair this weekend. An item I thought might be a good seller at this event are ankle bracelets and my inventory of those was gone. I looked at which colors were most popular in the past and what the school colors are for the University. I also made 3 different sizes - small (9 inches), medium (10 inches) and large (11 inches). Purple is one of the U's colors. I am continuing to use the new earring design I created last month. Gold, silver, blue, brown. I also made several versions of an earring style in blue requested by a friend. All have since sold. Which one of the blue ones below will Chrissy pick? 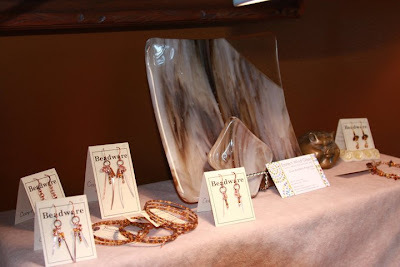 Perennial Vinters of Bainbridge Island is now selling Beadware's Stemware at the Poulsbo Farmers Market! The market is open Saturdays 9am -1pm . Perennial Vinters specializes in the delicate wines from the maritime-influenced cool climate viticulture of the Puget Sound. They have pioneered the establishment of an under appreciated grape named Melon de Bourgogne here in the Seattle area. You can learn more about the vineyard at their website. Know which glass is yours at a party with Stemware. Makes a wonderful host or hostess gift (along with a bottle of local wine of course!) Thanks to Heather for arranging this! With the start of my show season it is time to bring back this fun series of blog posts. This time my tent was at the Olympia Wooden Boat Festival. There was a lady in a crab hat hawking hot crab sandwiches. My friend Kandyse and her Blue Fox Glass. There was lots of food and fun. Like my new sign? And of course there were wooden boats. I had a chance this week to make some more of my newest, and extremely popular copper earrings. My favorite are the longer ones. They remind me of a jelly fish. I am using copper wire that I hammer flat, copper rings and ear wires and small glass and copper beads. If you see one you like you better act fast as I expect these to sell this weekend at the Wooden Boat Festival in Olympia! Send me an email and I will set them aside for you. I will be making more next week to take to Old Town Gallery in Silverdale and and Jigamagig Gallery in Gig Harbor and to list in my online store. The most popular items at my sale this past weekend were some brand new copper earrings. The three on the right sold Friday eve. The gold version on the left also sold Friday eve. So I whipped up a few more early Saturday morning.